As many of you already know, I am very physically active as a means to manage my MS symptoms, especially pain and fatigue and cognitive symptoms. A prominent part of this activity is my synchronized swimming. I love it. It is a part of who I am. The freedom in the water is incredible, and includes the feeling of personal power knowing that I can be totally free in the water. This year, I set a goal once again to swim with a team in synchronized swimming, and strive for excellence. 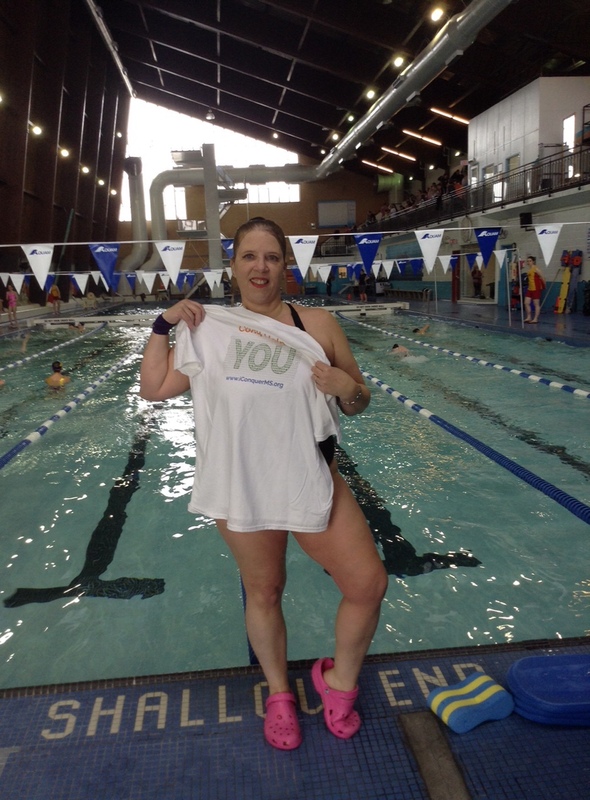 So, how does a person with MS prepare for a synchronized swimming event with her team – especially when her MS is flaring up? That is a really good question. This season, I began swimming with a group of women who rapidly became good friends, and huge supports. 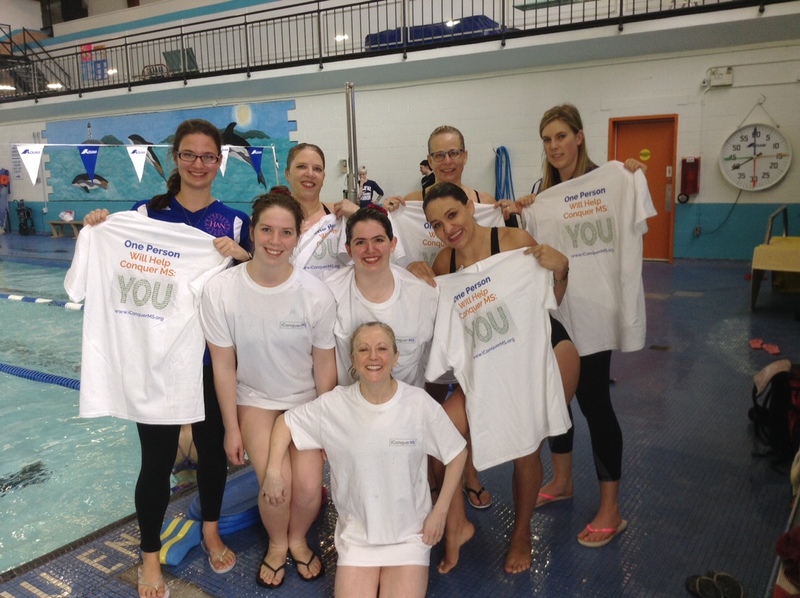 We came together by joining the Halifax Aqua Nova Synchro club, with amazing coaches (Kaitlin and Brooklyn). We all came from different backgrounds, with ages ranging from 18 to 55 years, and differing levels of expertise ranging from zero to 100. The two things we all had in common? A good sense of humour, and a desire to move and be active in the water. As many people with MS have experienced, the months of February to May can often be more difficult for us, with MS symptoms becoming more difficult to manage with the lingering colder and darker days. This has always been true for me… most of my worst flare-ups and exacerbations over the years have occurred during the spring months. Thursday: Fatigue hits hard by afternoon. Cog Fog maxed. I cannot find words in either english nor french. But the long weekend is hours away…hanging on with the help of understanding colleagues! A bit worried that this will affect my ability to perform the synchro routine the following weekend, but i am taking the week off, so all should be fine. I hope. Friday: first day of long weekend. I sleep in until 930AM. After a small breakfast, i am exhausted, in pain, and back in bed by 11AM. I wake up around 6PM, in time for dinner. No appetite so just nibbled. By 9PM, I am exhausted again (resting on the couch is SOOO tiring!). Back to bed for the night. Saturday: Woke 9AM. Went with hubby to do food shopping. Back in bed by 1130AM. Slept until 5PM. Back in bed, completely exhausted by 930PM. Monday: awake by about 8AM. Gotta move! Everything hurts from just sleeping for so long. Spasticity awful. Tried a gentle walk and yoga sequence. Wiped out by it, so back to bed at 11AM for another nap. Awake by 430PM. Back in bed by 9PM. Starting to worry that this is going to complicate my swimming goal because the fatigue is still so bad. Tuesday: Fatigue remains – not letting go. Napped from noon to 5PM. Went to swim practice despite fatigue, knowing that the movement will help the pain, and so hopefully help the fatigue too. My teams (my girls) is a fantastic support for me – physically, emotionally, mentally. They accept me as I am – and laugh with me at my cog fog that causes me to forget sections of the routine repeatedly and unpredictably. Their laughter and smiles and encouragement keep me going and raise my spirits. Wednesday: Slept from noon to 5PM again. Did some very gentle land exercise, then right to bed. But I am feeling like my head is a bit clearer, so maybe things are letting up? I read what I have written above as, and it sounds so mild to me. What’s the big deal? It doesn’t sound like a big deal really, does it? But when the fatigue, pain, and cog fog hit…it IS a big deal. It feels like you are trying to move through mud, and think under the influence of heavy medications. And the impact on managing day to day life is harsh at times – especially when it comes to giving up on any activities that make life enjoyable and balanced. My girls, my team, supported me through that – all of it. No matter how i performed, it was ok with them. Cog fog? That gives me a good basis for comedic moments. Laughter is good. Fatigue? I move slower, more gently, and rest more. It’s ok by them. Pain? The movement itself helps relieve the pain. Life balance? Being with my girls and laughing with them – that gives me a key ingredient to maintaining a good life balance. The results? Take a look for yourself. We had fun, the day was fantastic, and we have memories that will last, with a number of firsts for many of the team. Previous Previous post: MS Fatigue versus Regular Fatigue: What’s the difference?